Bryan Robson, in action for England, is the cover star as the 1986 World Cup gets closer. The magazine opens with rumoured tansfer activity by the Old Firm, with Rangers wanting to sign Richard Gough (he would eventually sign in 1987, after a year at Tottenham Hotspur) from Dundee United and Andy Goram (It took until 1991, from Hibs, for him to join) while Celtic want to sign Stevie Clarke from St Mirren. That is ex Chelsea player and West Brom manager Steve Clarke. Another Scottish player potentially on the move is John Robertson of Hearts, who has been attracting attention from Tottenham Hotspur. 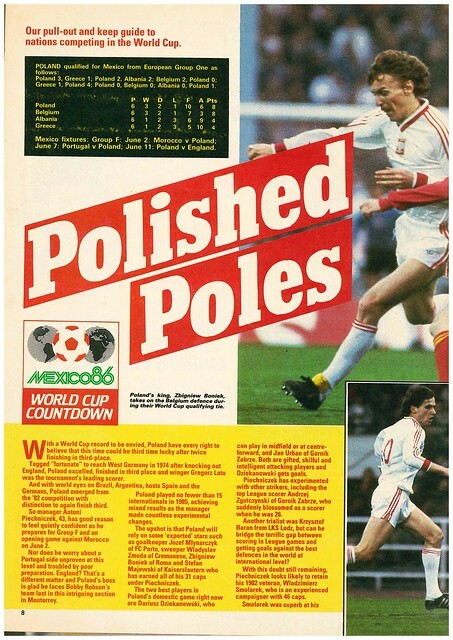 With the World Cup getting closer, there is a double page spread previewing Poland’s chances. Canada also get a preview. 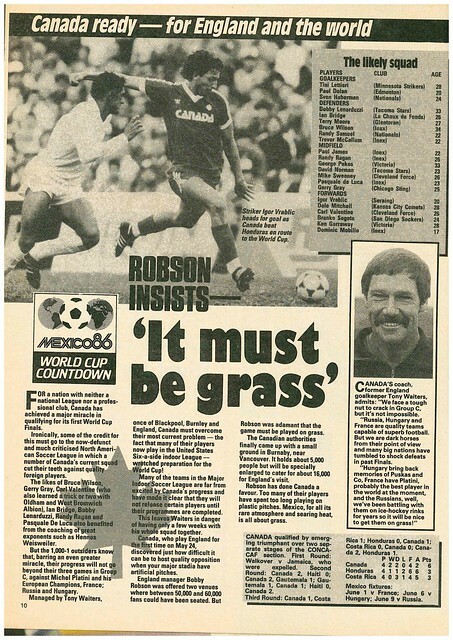 UK fans will get a glimpse of them before the tournament as they play England in a friendly at a 16,000 capacity venue, due to England manager Bobby Robson insisting that the game be played on grass, and not artificial grass that is used in Canada’s bigger stadiums. 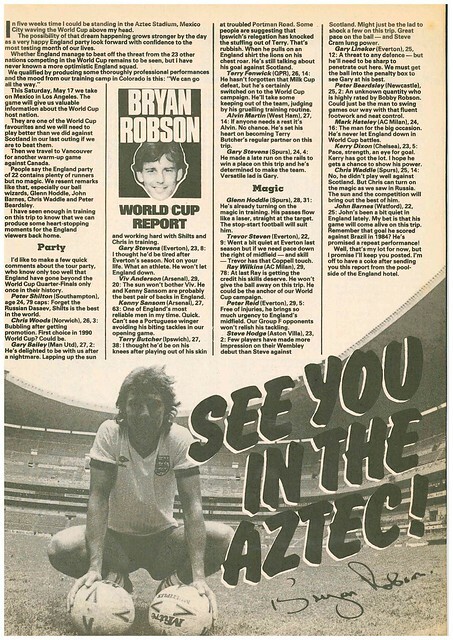 Bryan Robson uses his column to argue the case for England as World Cup winners, giving a brief profile of the 22 players tasked with taking the trophy home from Mexico. 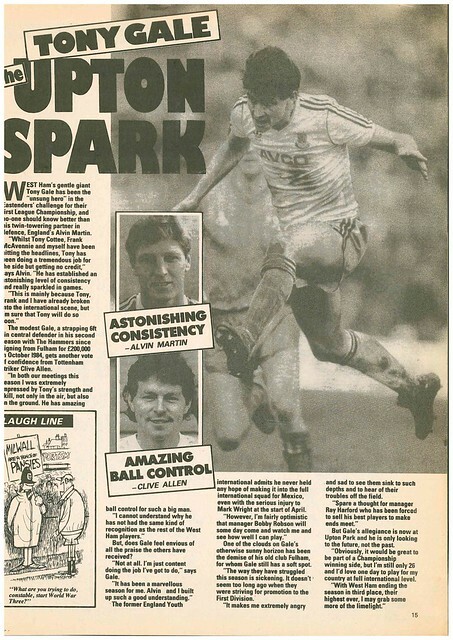 Swindon Town won the 4th division, and this gets a double page spread, with manager Lou Macari giving most of the credit to defender Colin Calderwood. 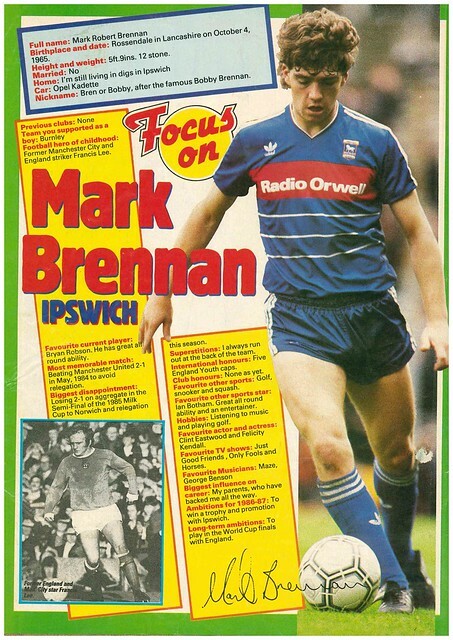 Also promoted and getting a double page spread were Norwich City. 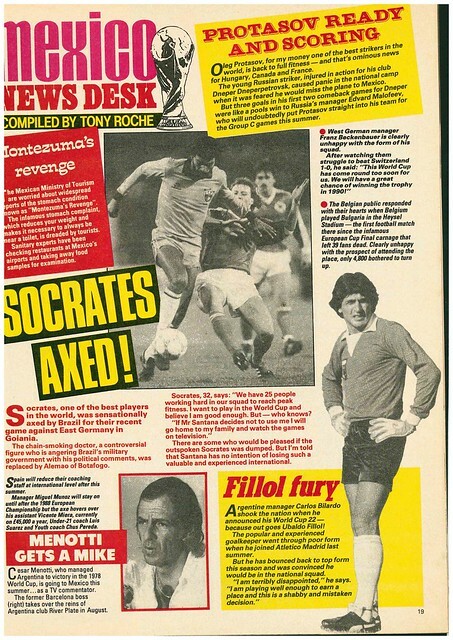 In World Cup news, Socrates was left out of Brazil’s friendly against East Germany, while West Germany manager Franz Beckenbauer says this World Cup has come too soon for his team, but they have a great chance of winning the trophy in 1990. 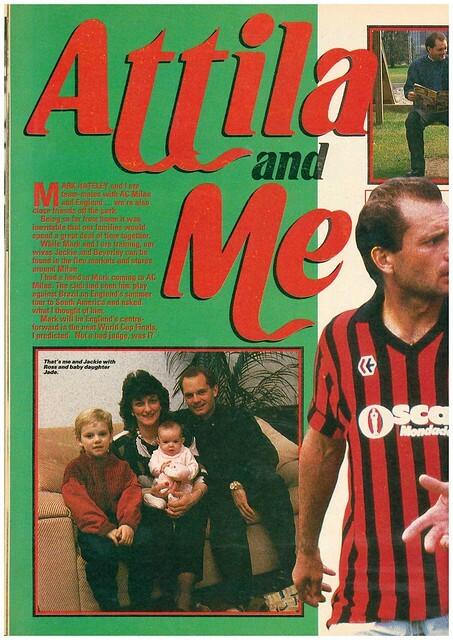 The centre page poster is of AC Milan’s English duo of Ray Wilkins and Mark Hateley, settling in in Italy, complete with family portraits. Former Motherwell player Tom Hately wasn’t pictured, because he wasn’t born until 1989. 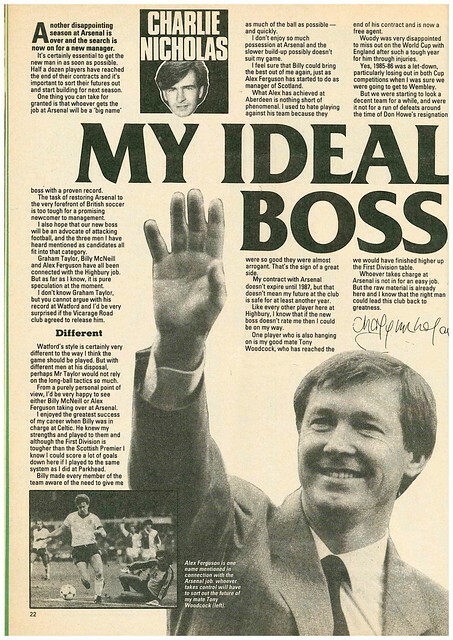 Charlie Nicholas uses his column to discuss the vacant manager’s position at Arsenal, suggesting that his preference is Alex Ferguson or Billy McNeill. 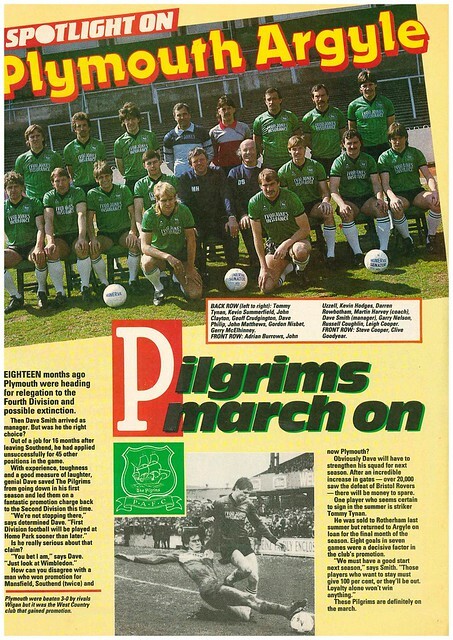 The magazine goes green for a few pages, with features on Northern Ireland and Plymouth Argyle. 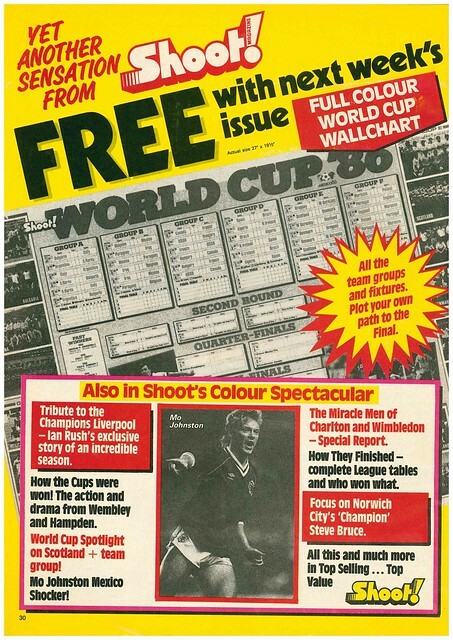 There was an advert for the following week’s edition, which had a World Cup wallchart. 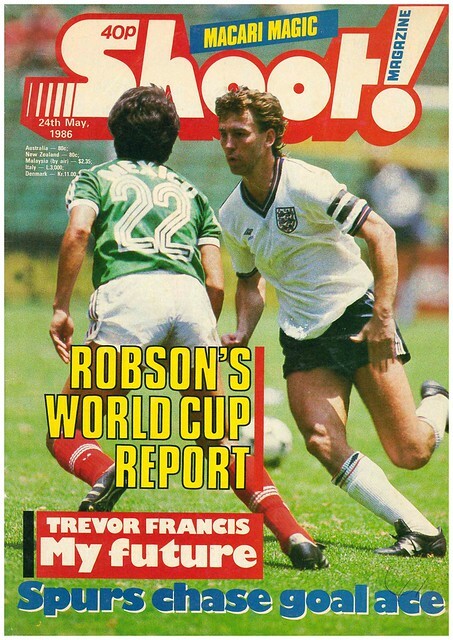 It was a World Cup that Trevor Francis won’t be playing. 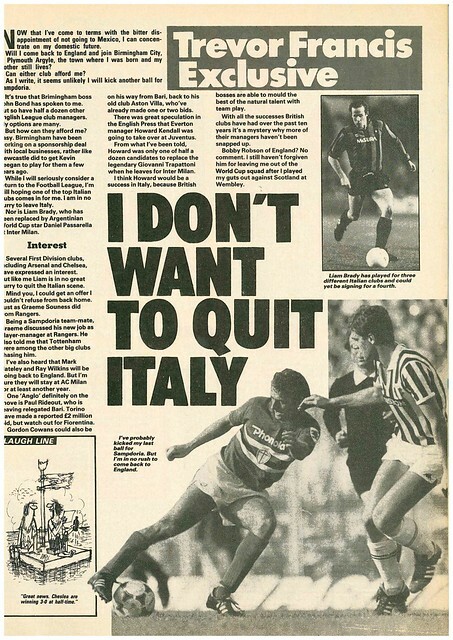 He tells Shoot of his disappointment of not being selected for England, and that he’s not planning on leaving Italy, where he is currently based. Nottingham Forest winger John Robertson, pictured holding the European Cup, is the cover star accompanied by the headline “CAN FOREST RETAIN THE EUROPEAN CUP?”, as Europe’s three competitions are getting ready to swing into action. The biggest threat to Forest’s grip on the trophy, in Robertson’s opinion, came from Liverpool, who he said he hope would get put out early, but admitted the two teams playing in the final would be great for English football. As it turned out, Liverpool had an early exit, a First Round exit to Soviet team Dinamo Tblisi, while Forest would go on and retain the trophy, beating Hamburg 1-0 in Madrid. Turning over the page, Shoot does a full page feature on the chances of the British sides in their ties, against a various mix of opponents. In news, Alan Ball Snr (father of 1966 World Cup winner of the same name) is singing the praises of Scandinavian players as representing value for English clubs, having just spent three years coaching in Sweden. Colin Bell of Manchester City announced his retirement aged 33. Lawrie McMenemy expressed his fears of a “Super League” emerging within England’s top flight, due to the spending power of some clubs. 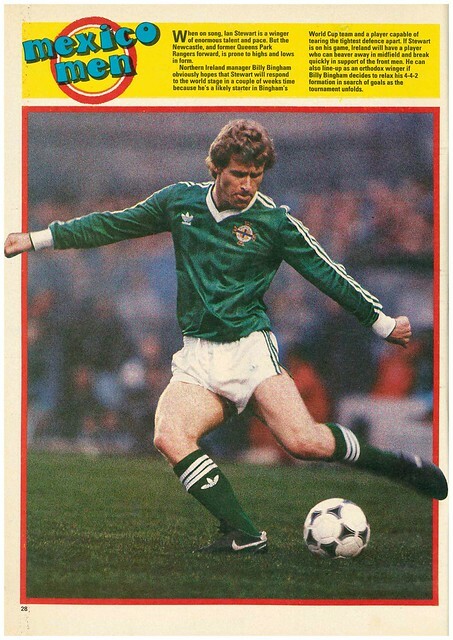 Brian Quinn moved from Larne to Everton for £60,000 – a record between clubs from Northern Ireland and England, and is aiming to be the 10th Everton player to play for Northern Ireland since World War II, just short of the 14 players supplied by joint record holders Manchester United and Linfield. Alex Sabella turned down a move from Sheffield United …….. because his wife wasn’t keen on living in the North-East. Motherwell manager Ally MacLeod is to be investigated by the SFA after publishing a book claiming that Willie Johnston wasn’t the only Scotland player to have taken illegal substances at the previous summer’s World Cup. In his column, Ray Clemence is looking forward to his first trip to the Soviet Union, for Liverpool’s European Cup tie with Dinamo Tblisi. Shoot does a full page feature on the West Country, interviewing a player from Plymouth Argyle, Exeter City and Torquay United on the future of football in the area. Dave Watson, recently signed for Werder Bremen, was sent off in his second game for the club, and bemoans the strictness of German referees, while also dismissing criticism of his signing by German newspaper Bild. There was a four page feature on Manchester City, including a double page colour poster. 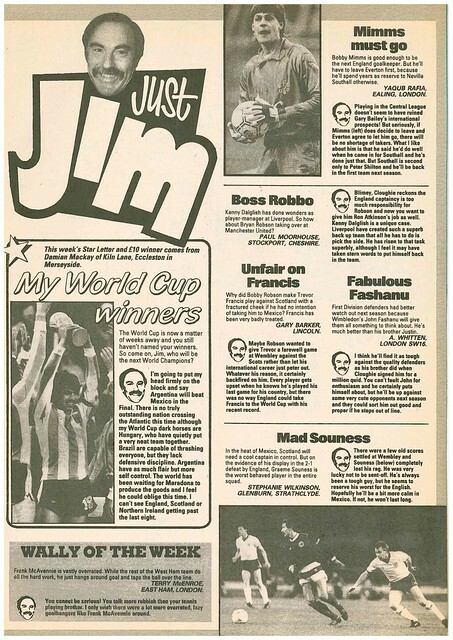 Tommy Docherty is in fighting form, proclaiming “I’m still one of the best”, and that he is happy with his summer spending having spent £1m on five players, including England Under 21 goalkeeper Chris Woods. 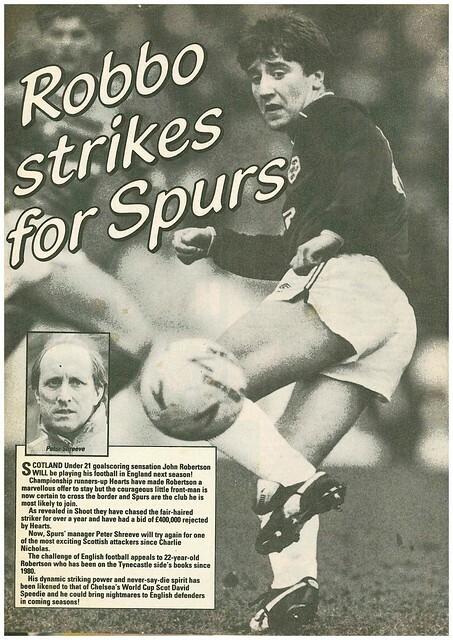 Docherty had been sacked by Manchester United two years previously due to an extramarital affair, and was hoping his spell at Loftus Road would propel him back into the big time. QPR finished 5th in Division Two (no play-offs then, only the top 3 went up) and Docherty was sacked, before being reinstated, than sacked again in October 1980. “Life has never been happier at the aptly named Gay Meadow” writes Shoot, presumably in The Flintstones sense, as manager Graham Turner has just led them into England’s second tier for the first time. Redford joined Rangers in 1980 for a Scottish record, won four trophies at Ibrox, and played for Dundee United in the 1987 UEFA Cup Final. Redford died in January 2014, aged 53. 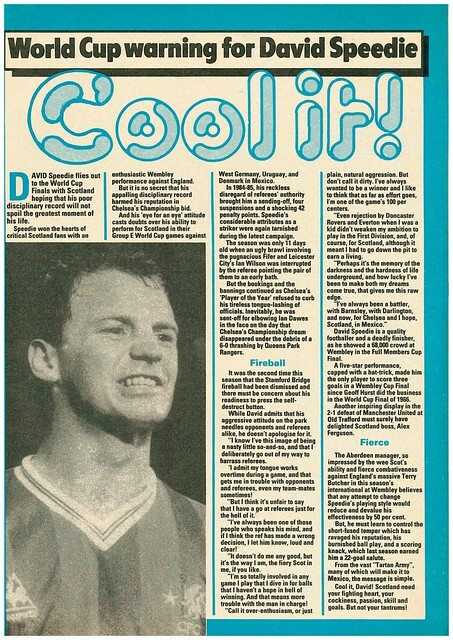 Gordon McQueen uses his column to claim that he scored United’s goal against Southampton on the opening day of the season, which was credited as an own goal, and denies rumours that Mickey Thomas was to be sold to Everton in an exchange for Dave Thomas. 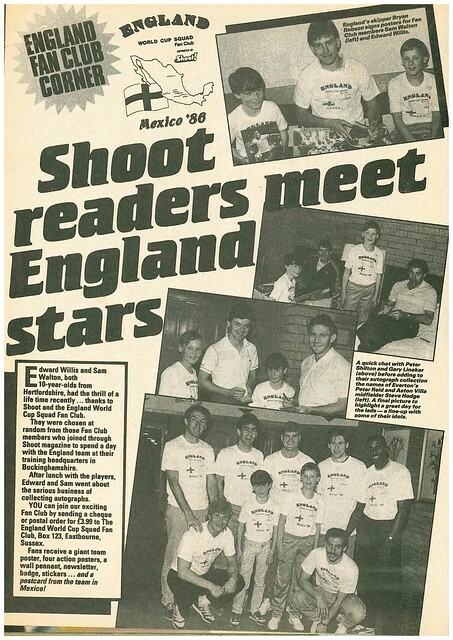 On the back page, there was a colour poster of new Crystal Palace signings Gerry Francis and Mike Flanagan.